Is there a better alternative to Hostal? Is Hostal really the best app in Network category? Will Hostal work good on macOS 10.13.4? Adds the ability to block Google services, advertising, and tracking. Adds the ability to restore system default hosts file. Makes improvements to social media blocking. Makes improvements to ad blocking. Hostal needs a rating. Be the first to rate this app and get the discussion started! 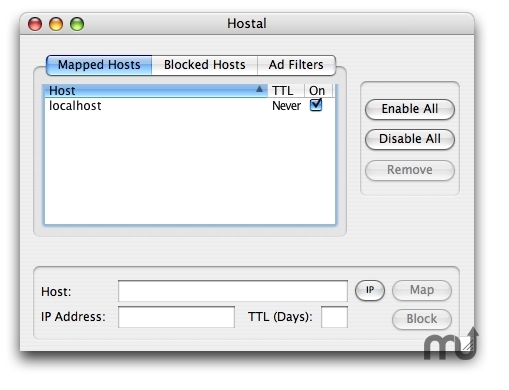 Hostal is a user friendly DNS database software for novices and advanced users. Allows local IP address mapping by creating a Hosts file for your computer. Local IP mapping can help speed up Web surfing, and allows content filtering and privacy protection by blocking designated hosts. Hostal ships with a large database of advertising and adult content sites and easily allows you to customize or add your own. Hostal supports Time to Live to prevent stale host mappings. For users on a network, Hostal detects an existing Hosts file and incorporates those settings as well. Hostal supports exporting hosts files for different platforms. Easy to use database makes managing a Hosts file a snap.